The French champions are closely monitoring the England international, who made his debut against Croatia in October, as he continues to impress in the Bundesliga. Premier League clubs Manchester United and Arsenal are also thought to be keen, but Manchester City boss Pep Guardiola appeared to rule out re-signing him. "I think when he decided to move on from here, it is because he doesn't want to be here," Guardiola said in October. "Maybe he thought he would get more minutes at Dortmund and I can understand that." Sancho rejected the offer of a professional contract at City in search of regular first-team football, signing for Dortmund for £8m in 2017, and he has found that in this - his breakthrough season. 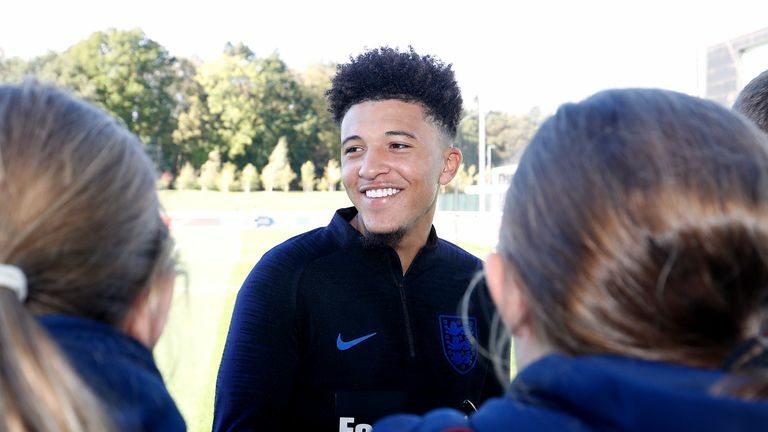 He is one of a number of young English players that have moved to Germany for regular games and, speaking in October, he gave an insight into the bravery of his decision to move abroad at such a young age. "Moving away from home was the biggest challenge," Sancho said. "Leaving my mum and my sisters behind; I miss them a lot. But I wanted to do what was best for me, and that was what I did. "Not everyone is comfortable moving from home. If you're ready to play abroad and you believe in yourself, why not?"